Deep in the world of Leila + Olive lives a garden where the mysteries of the universe are revealed. They bloom as eternal truths printed on decks of cards that intertwine botanical mythology and art, so any willing reader can learn the secrets of the natural world. The latest in the world of Leila + Olive is the Ophidia Rose tarot, a 72-card deck that draws on the timeworn truth of the archetypal tarot deck. This deck comes after a year of work, and four changing seasons that each impacted the cards in a different way. "The Ophidia Rosa is about transformation: the conversion of seed into bloom, the movement of crescent bodies into full moons, and the renewal of childlike wonder from weary, full-grown forms. It's a very visceral form of Tarot, and one that required digging deep into the garden, with all the twists and turns and dirt one might encounter among those thorns and worms and seeds and leaves." Each card features the flora and fauna that make up Leila + Olive’s world, as well as a fold-out guidebook to help the reader along the way, so they can allow their intuition to bloom and shine. Since this pamphlet has clever sayings like “shuffle off coils that ground grand intentions. We’re winged and weeded, a pure mother of invention,” for Death, practitioners can easily find their own path of interpreting the cards. Even though Leila + Olive has released an oracle deck in the past, this deck was different. Instead of drawing on her own mythology, Nicole was tasked with creating her own work within a pre-existing structure. But thankfully, both decks hold their own power and meaning. 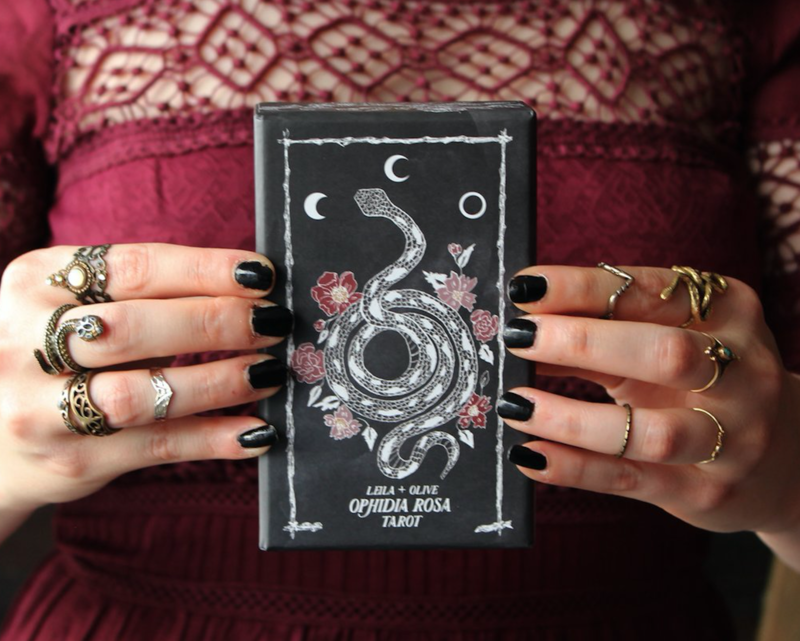 The Ophidia Rosa tarot is the perfect addition for anyone who feels the serpentine movements of transformation bubbling in their veins. Whether you’re a novice or a veteran tarot reader, you’re sure to learn something with this deck. The Ophidia Rosa Tarot deck can be purchased here for $48.